The Pull-behind scooter is perhaps the most popular scooter for diving. With handles positioned at the bow or stern, the operator is pulled behind the scooter as the motor is engaged. Scooters come in varied sizes, shapes and speeds. Manned Torpedos come in different sizes according to use. First developed for military use, manned torpedos can provide a useful means of moving through the water at greater speeds. A manta board is essentially a board tied to a boat that is pulled through the water. The swimmer angles the board to maneuver down deeper into the water. The board is often shaped similar to a Manta Ray, hence the name. Using a scooter to move through the water while diving or snorkeling can increase your range of travel. The scooter can take you past your range of swimming strength and allow you to cover more water and see more. If you know your destination for diving is a greater distance away, a scooter can get you there faster than simply swimming which will allow more time under water whether you are scuba diving or snorkeling, and more time underwater means more fun! 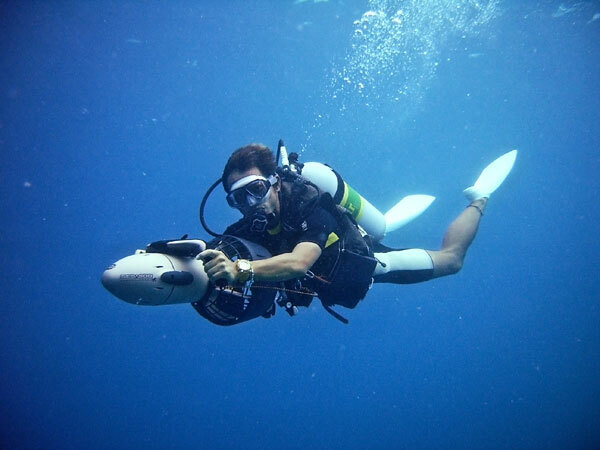 Using a scooter will allow divers and snorkelers to swim with greater ease, using less energy and staying calmer. Snorkelers and free divers will especially appreciate not having to exert as much energy to swim to deeper waters. Because scooters can get you to deeper waters quicker, it is important to remember a few steps to take when diving. When diving deep, you may need to equalize your mask with the pressure of the water. If you are traveling deep quickly and don't think about it, the pressure may cause some pain before you can stop and equalize. When diving into deeper waters, a scooter can help you travel with greater ease and at faster speeds, but it is important to not forget about descending and ascending at appropriate speeds to allow your body to equalize with pressure differences. Forgetting this can cause great pain and injury. 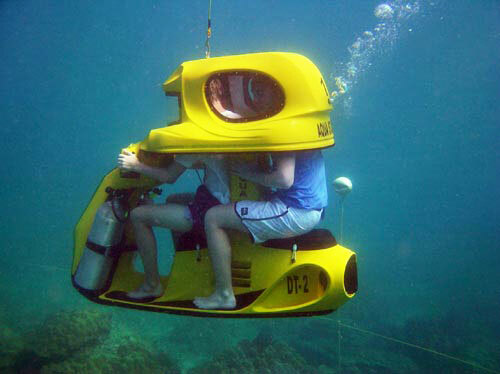 Scooters can provide a great time when diving or snorkeling. Whatever your method, enjoy your time in the water!